The first few months of the year are always busy for us. Madison's bday is in January, Rylie's bday and my bday are in February, our anniversary is in March and Tim's bday is in April! This year Rylie turned 8 and Madison turned 5! I am also currently filling out Kindergarten enrollment papers for Madison for next year...crazy! 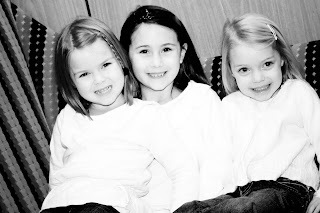 Our girls are getting so big and every year I am reminded at how quickly life flies by. Unfortunately, we didn't get any bday pics this year for me to share. Taitlyn was very sick on the day of Madison's party so Tim had to stay home with her. It was at Chuck-E-Cheese so between all of the friends and party craziness I didn't have an opportunity to take any pictures. I did have a couple of wonderful friends there that took some for me so luckily we do have some hard copy pictures now. I just can't figure out how to pull pictures of snapfish to post here!?!? Anyway...it was so much fun! Overall though, both parties were great and our girls are now officially 8, 5 & 3...until July at least! Once again, the girls had a great time dressing up for Halloween this year! I thought I would share some pictures of them in their costumes! Last September, Daddy took the girls for a day "hike" to the Ice Caves so mommy could have a little "break". They had a great time and, I have to admit that when they got back and I saw the pictures I was a little sad I didn't go...although the quiet time was very nice too! Full shot of the Caves. If you look real close you can see the girls running up to the cave! I don't know what was up the the poses in this picture but I thought it was cute!